Last night, iconic music legend and humanitarian Steven Tyler celebrated his second annual Grammy Awards Viewing Party to benefit Janie's Fund with over 500 friends and supporters, including Sharon Stone, Leonardo DiCaprio, Mark Wahlberg, Alice Cooper, and more at Raleigh Studios Hollywood. Hosted by Jane Lynch, the exclusive gala featured a live viewing of the 61st annual Grammy Awards telecast, three-course dinner by Crumble Catering, and an epic night of music with America's all-time top-selling rock 'n' roll band AEROSMITH. The second annual event raised over $2.8 million dollars for Janie's Fund, a philanthropic initiative created by Steven Tyler in partnership with Youth Villages, one of America's leading nonprofits, to bring hope and healing to girls who have suffered the trauma of abuse and neglect. Tyler first gave voice to this cause with his hit "Janie's Got A Gun", and his establishment of the fund ensures that these vulnerable girls will have an enduring voice for years to come. Since the November 2015 launch of Janie's Fund, the organization has raised nearly $8 million, directly helping more than 800 girls and providing more than 115,000 days of therapeutic care. Additional celebrities, VIP guests and Janie's Fund supporters in attendance included Ashlee Simpson and Evan Ross, Audrina Patridge, Caitlyn Jenner, David Foster, Dinah Jane (recording artist), Duff McKagan (GUNS N' ROSES) and Susan Holmes McKagan, Emile Hirsch (actor), Haley Reinhart (recording artist), Jesse Metcalfe (actor), Julianne Hough and Brooks Laich, Kelsey Grammer and Kayte Walsh, Kim Petras (recording artist), Lauren Jauregui (recording artist), Nicole Scherzinger ("The Masked Singer"), Nuno Bettencourt (EXTREME), Rumer Willis (actress), Russell Dickerson (recording artist), Shep Gordon, Teddi Mellencamp ("Real Housewives Of Beverly Hills"), Terry Crews ("Brooklyn Nine-Nine"), Ty Dolla $ign (recording artist), The Sisterhood (Alyssa Bonagura and Ruby Stewart), X Ambassadors (Sam Harris, Casey Harris and Adam Levin) and more! Following the star-studded red-carpet arrivals, Tyler hosted guests at an intimate cocktail reception — in signature Steven Tyler style — the Raleigh Studio sound stage was transformed into a rock 'n' roll living room complete with medieval wrought iron chandeliers with edison drop lights, plush lounges, and bookshelves filled with personal photos. Surrounding the room were never before released vintage photos of Tyler on whitewashed wooden planks. During the gala, guests were entertained by master mentalist Lior Suchard, The London Essentials and Sesa Wo Suban, a West African drumming group featuring the girls supported by Janie's Fund. The night also featured moving speeches by Edie Allen and Janie's Fund ambassador Adriana Turmel who shared their personal stories of abuse and benefits of Youth Villages' programs. Immediately following the telecast, the event featured an exciting live auction, conducted by Andrew Boose. 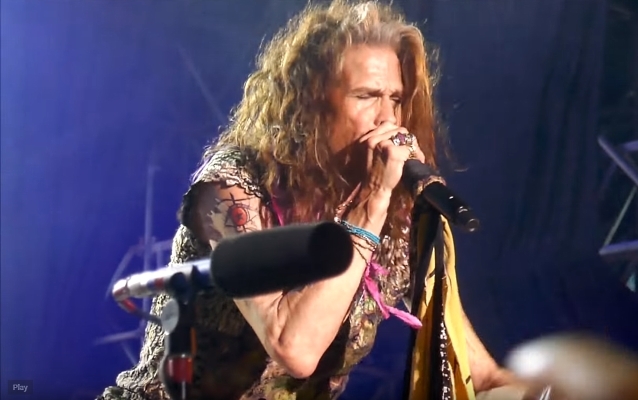 The evening was capped off with AEROSMITH revving up the crowd with their classic hits "Janie's Got A Gun", "Sweet Emotion", "Cryin'", "Dream On" and more. The band closed its set with "Walk This Way" and was joined by Sharon Stone who accepted Tyler's dare to go up on stage to dance and play the harmonica.